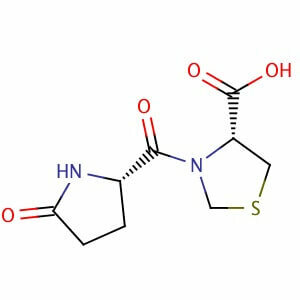 Pidotimod, whose chemical name is (4R)-3-(5-oxo-L-prolyl)-l ,3-thiazolidine-4-carboxylic acid, was first disclosed in ITI 231723. It is a synthetic peptide-like molecule provided with an in vitro and in vivo immunomodulating action (Giagulli et al., International Immunopharmacology, 9, 2009, 1366-1373). The immune system assists in maintaining a homeostatic balance between the human body and all foreign substances. An abnormality in this balance may cause a defective or aberrant response towards non-self substances, as well as loss of tolerance toward self-antigens, in such cases, the immune system imbalance exhibits clinically as signs of disease. Pidotimod has been shown to induce dendritic cell maturation and up-regulate the expression of HLA-DR and co-stimulatory molecules CD83 and CD86, which are integral to communication with adaptive immunity cells. 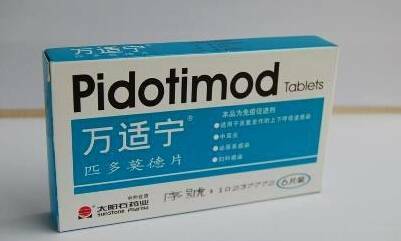 Pidotimod has also been shown to stimulate dendritic cells to release pro-inflammatory molecules such as MCP-1 and TNF-a cytokines, and to inhibit thymocyte apoptosis caused by a variety of apoptosis-inducing molecules. Pidotimod exerts a protective action against infectious processes, although not through direct antimicrobial or antiviral action. Rather, pidotimod stimulates both innate and acquired immunity by enhancing humoral and cell-mediated immunity mechanisms. Pidotimod, which may be administered as solid or liquid forms, for example, via an oral route, has been shown to increase natural resistance to viral or bacterial infections in animal models. Efficacy demonstrated in patients includes respiratory, urinary and genital infections, in particular recurrent respiratory infections in pediatric patients, respiratory infections in asthmatic patients and chronic obstructive pulmonary disease in adults and elderly patients. Besides exhibiting activity to illnesses characterized by immune defects, pidotimod has been reported to be of benefit in to patients with other kinds of diseases, not directly related to immune defects, including gastroenterology diseases such as ulcerative colitis and irritable bowel syndrome, and dermatological diseases such as psoriasis and atopic dermatitis where symptoms relating to these diseases have been attenuated. In gastroenterology diseases pidotimod may be administered either by oral or by rectal route. Oral route or topical application, for example in creams or gels containing pidotimod, may be used to treat dermal conditions. Further use of pidotimod includes treatment of inflammatory diseases, in particular those characterized by an aberrant activation of the non-canonical NF-kB pathway. Diseases implicated by such activation include allergic diseases, autoimmune diseases, and numerous other inflammatory diseases. Allergic diseases include allergic rhinitis, allergic conjunctivitis, contact dermatitis, eczema and allergic vasculitis. Autoimmune diseases include alopecia areata, ankylosing spondylitis, autoimmune cardiomyopathy, autoimmune connective tissue diseases, autoimmune enteropathy, autoimmune hepatitis, autoimmune peripheral neuropathy, autoimmune pancreatitis, autoimmune polyendocrine syndrome, autoimmune thrombocytopenic purpura, autoimmune urticaria, autoimmune uveitis, celiac disease, chronic fatigue syndrome, cystic fibrosis, hashimoto’s thyroiditis, idiopathic pulmonary fibrosis, idiopathic thrombocytopenic purpura, IGA nephropathy, juvenile idiopathic arthritis for juvenile rheumatoid arthritis, or Still’s disease) Kawasaki’s disease, lichen planus, lupus erythematosus, rheumatoid arthritis, rheumatic fever, Sj5gren’s syndrome, spondyloarthropathy, temporal arteritis (or giant cell arteritis), urticarial vasculitis, and vitiligo. Other inflammatory diseases include Alzheimer’s disease, atherosclerosis, chronic liver diseases, chronic nephropathy, gastritis, glomerulonephritis, hydradenitis suppurativa, hypogammaglobulinemia, interstitial cystitis, lichen sclerosus, liver steatosis, metabolic syndrome, obesity, Parkinson’s disease, pemphigus vulgaris, post-ischemic inflammation, raynaud phenomenon, restless leg syndrome, retroperitoneal fibrosis, and thrombocytopenia. A method for producing pidotimod, characterized in that: comprising the steps of: a) L- thiazolidine-4-carboxylic acid: L- cysteine formaldehyde solution was added dropwise, stirred at room temperature, filtered to give L- thiazolidine-4-carboxylic acid; (2) metal ion load type cation exchange resin preparation: strongly acidic with hydrochloric acid cation exchange resin is converted to the hydrogen form, the hydrogen form strong acid cation exchange resin was added a solution of a metal ion compound In, 40 ~ 80 ° C for 1 to 6 hours, cooled to room temperature, and dried to obtain a supported metal ion cation exchange resin; (3) Synthesis of pidotimod: the step (1) of L- thiazolidine – 4- carboxylic acid, in step (2) of the load as a catalyst metal ion type cation exchange resin, L- pyroglutamic acid and N, N- dimethylformamide mixed, 40 ~ 80 ° C for 1 to 4 hours, filtered to give a white solid, the white solid was acidified with hydrochloric acid, to give the finished pidotimod. In four flask IOg L- thiazolidine-4-carboxylic acid, 11. 3g g L- pyroglutamic acid, 320mL N, N- dimethylformamide, 12g modified resin, 70 ° C the reaction 2 hours. Filtration, the reaction mixture by rotary evaporation, after removal of part of the solvent, placed in an ice bath to cool, the precipitated solid was suction filtered to give a white solid, this white solid was acidified with 37% hydrochloric acid, was allowed to stand at KTC, crystallization, filtration, a white product 14. 4g, a yield of 78.3%. Measured melting point 192 ~ 194 ° C, [a] 25D = – 150 ° (literature values mp: 192 ~ 194 ° C, [a] 25D = – 150 °).The whole preparation reaction pidotimod total yield of 64%. By HPLC, pidotimod content of 98.5%. Pidotimod was prepared following Example 1 of EP0422566 Al . A solution of 16.78 g (0.084 mole) of ethyl L-thiazolidine-4-carboxylate hydrochloride in 33 ml of water is treated with 16.78 g of potassium carbonate and extracted with 40 ml of ethyl acetate. The organic phase is dried over sodium sulfate, filtered and diluted to 85 ml with ethyl acetate. The solution is stirred and cooled to 0-5°C, then 19.2 g (0.093 mole) of dicyclohexylcarbodiimide dissolved in 20 ml of ethyl acetate and 12 g (0.093 mole) of L-pyroglutamic acid are added thereto. The reaction mixture is stirred for 1 hour at 0-5°C, then 12 hours at room temperature, dicyclohexylurea is filtered, the filtrate is evaporated under vacuum and the oily residue, consisting in ethyl 3-(L-pyroglutamyl)-L-thiazolidine-4-carboxylate is taken up into 25 ml of water. 3.73 g of sodium hydroxide dissolved in 13.3 ml of water are dropped into the resulting solution. After 30 minutes, the reaction mixture is acidified with concentrated hydrochloric acid at 0-5°C, kept for 2 hours at 5°C, then filtered washing with little cool water and dried to obtain 17.8 g (87.6%) of 3-(L-pyroglutamyl)-L-thiazolidine-4-carboxylic acid, m.p. 193-194°C. 23 g (0.1 mol) of L-N-t-butoxycarbonylpyroglutamic acid (E. Schröder and E. Klinger, Ann. Chem., 673, 1964, 202) and 16.1 g (0.1 mol) of ethyl L-thiazolidine-4-carboxylate are dissolved in 150 ml of THF, to the solution stirred at 0-5°C, 21 g (0.105 mol) of dicyclohexylcarbodiimide are added and the slurry is stirred for 15 hours at room temperature. The dicyclohexylurea is filtered, the wear filtrate is evaporated u.v. and the oily residue is kept in 40 ml of water. In the solution 6.6 g of potassium hydroxyde in a little water are dropped in 30′ at 15-20°C, the pH is adjusted to 2 with hydrochloric acid at 0-5°C and after 2 hours the precipitated L-pyroglutamyl-L-thiazolidine-4-carboxylic acid is filtered and dried, giving 88%, mp. 193-4°. The synthesis of pidotimod has been carried out using N-tert-butoxycarbonyl-L-pyroglutamic acid as starting material, in order to avoid the formation of diketopiperazine derivatives. L-Glutamic acid (I) was condensed with di-tert-butyl dicarbonate by means of triethylamine in DMF to give N-(tert-butoxycarbonyl)-L-glutamic acid (II), which is dissolved in THF and treated with dicyclohexylcarbodiimide (DCC) to obtain N-(tert-butoxycarbonyl)-L-glutamic anhydride (III). The treatment of anhydride (III) with dicyclohexylamine in THF-ethyl ether affords the dicyclohexylamine salt of N-(tert-butoxycarbonyl)-L-pyroglutamic acid (IV), which by acidification with aqueous citric acid yields the corresponding free acid (V). 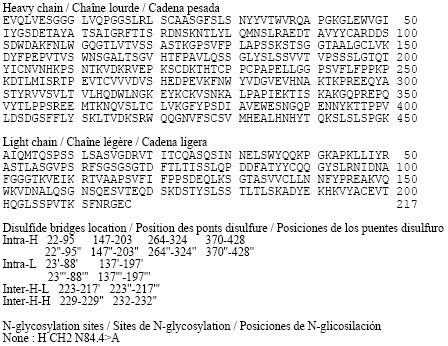 The condensation of equimolecular amounts of N-(tert-butoxycarbonyl)-L-pyroglutamic acid (V) with L-thiazolidine-4-carboxylic acid ethyl ester (VIII) by means of DCC in methylene chloride gives the coupled ester (IX), which is hydrolyzed with aqueous NaOH, and the corresponding sodium salt acidified to yield the N-tert-butoxycarbonyl derivative (X). Finally, this compound is deprotected with trifluoroacetic acid to obtain crystalline pidotimod (XI). The intermediate thiazolidine (VIII) has been obtained as follows: Esterification of L-thiazolidine-4-carboxylic acid (VI) with ethanol by means of SOCl2 gives the corresponding ethyl ester hydrochloride (VII), which by treatment with K2CO3 in water yields the free ester (VIII). 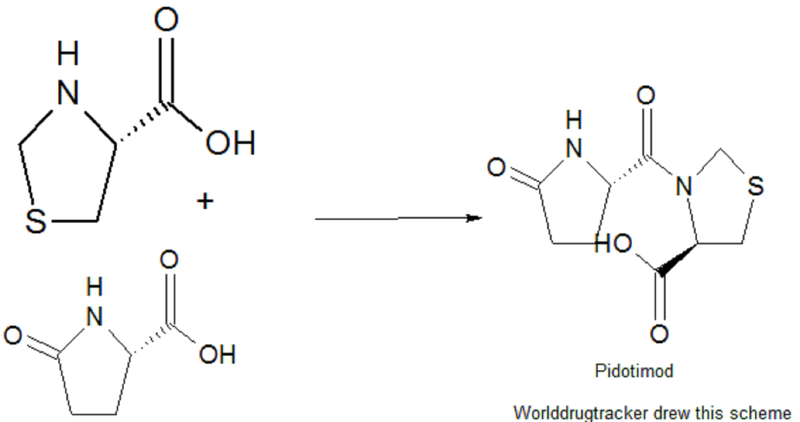 Two new related routes for the synthesis of pidotimod have been reported: 1) The condensation of L-pyroglutamic acid (I) with L-thiazolidine-4-carboxylic acid ethyl ester (II) by means of dicyclohexylcarbodiimide (DCC) in methylene chloride gives the corresponding dipeptide ethyl ester (III), which is saponified with aqueous 1N NaOH. 2) By condensation of the activated ester L-pyroglutamic acid pentachlorophenyl ester (IV) with L-thiazolidine-4-carboxylic acid (V) by means of triethylamine in DMF. Du XF, Jiang CZ, Wu CF, Won EK, Choung SY (September 2008). “Synergistic immunostimulating activity of pidotimod and red ginseng acidic polysaccharide against cyclophosphamide-induced immunosuppression”. 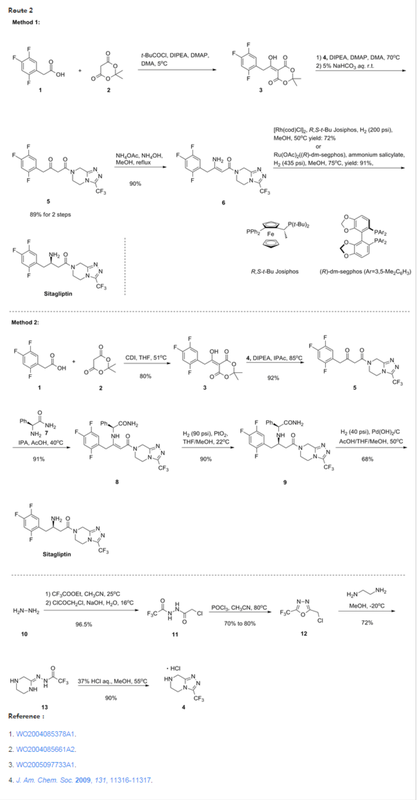 Archives of pharmacal research 31 (9): 1153–9.doi:10.1007/s12272-001-1282-6. PMID 18806958. By DR ANTHONY MELVIN CRASTO Ph.D in Peptide drugs, Uncategorized on July 25, 2016 .